A complete workshop on using spiritual wisdom to create financial security and prosperity. To build the financial future you want, where do you begin? Not with your bank account, your paycheck, or 401(k)—the best place to start is to look within. As successful wealth advisors and dedicated spiritual practitioners, Spencer Sherman and Brent Kessel have discovered that if we disarm the charged emotions and distorted expectations we have about money, the path to prosperity becomes a surprisingly easy journey. With The Money and Spirit Workshop, they present a unique and powerful program for transforming your financial life—to increase your wealth, support your highest goals, and turn money into a lifelong ally. Why do we so often entangle our sense of self-worth with our net worth? It is because our subconscious beliefs about money, formed during childhood, are in charge of most of our financial decisions. Using proven tools like the Eight Financial Archetypes and the Money Breath, Sherman and Kessel show you how to reveal—and reshape—your own deepest relationship with money. By transforming your unconscious myths about scarcity, sufficiency, and self-reliance, you can break out of unhealthy patterns around money—and bring your true creativity and wisdom to all your financial decisions. By understanding and healing your inner relationship with money, you can remove stress, worry, and confusion from the nuts-and-bolts of your finances. Offering simple guidelines and emotion-free practices for handling your savings, income, and investments, Sherman and Kessel reveal how you can achieve security and happiness, no matter how much money you have. 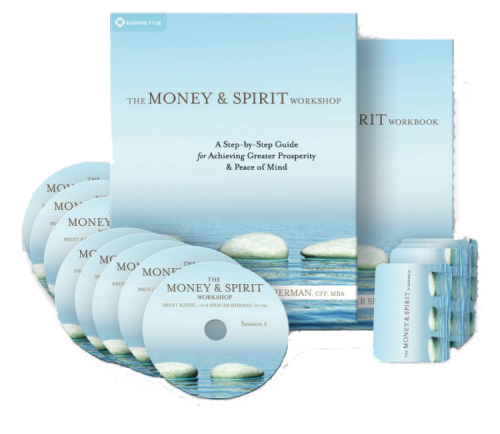 The Money and Spirit Workshop is a comprehensive home-study curriculum to transform your financial life, creating lasting fulfillment and prosperity. I sent a complaint that the download is incomplete and got no answer.